From the lowliest peasant to the Emperor himself, non-player characters (NPCs) are the lifeblood of your adventures in Rokugan. These characters are everyone in Rokugan who is not one of your heroes—and though they may enter the story as enemy or ally, friendly rival or reluctant compatriot, NPCs are a Game Master’s most important tool in bringing the rich world of Legend of the Five Rings Roleplaying to life. 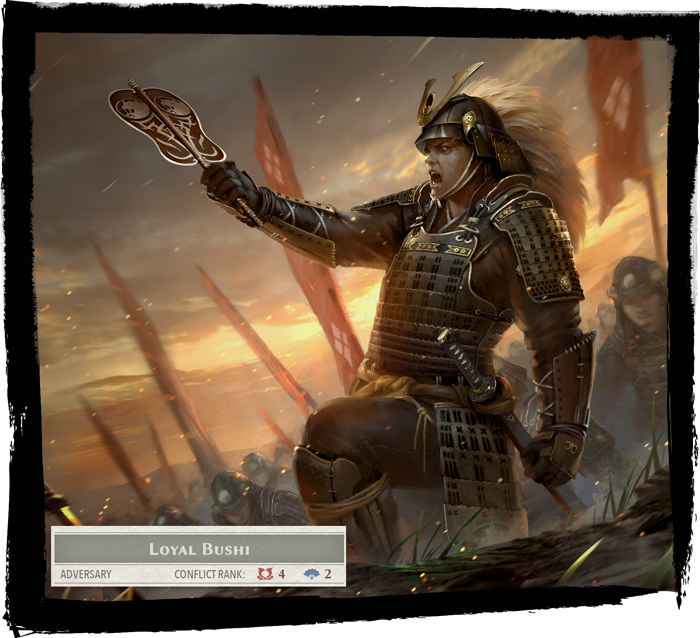 Join us today as we take a closer look at the denizens of Rokugan, as featured in the Legend of the Five Rings Roleplaying Core Rulebook! Generally speaking, NPCs are divided into two classifications. Minions are simply the tools of drama—they exist to do a thing. They are the guard who must be fooled, the farmer who sweats in the fields, and the bandit who meets razor-sharp justice to increase a samurai’s glory. Adversaries, however, fulfill the recognizable supporting roles in your drama. They have motivations and methods, and they can be hindered or aided by the actions of the characters. Some may be purely antagonistic, the foulest of the foul, but most enemies will simply be those whose ambitions run contrary to the goals of the players. Some adversaries may even not be adversarial at all, instead representing opportunities for knowledge, resources, or favor. Every NPC has an array of stats, just like the player characters, but they also have a unique characteristic: their Conflict Rank. This rank is a rough measure how dangerous this NPC can be in combat or intrigue situations. 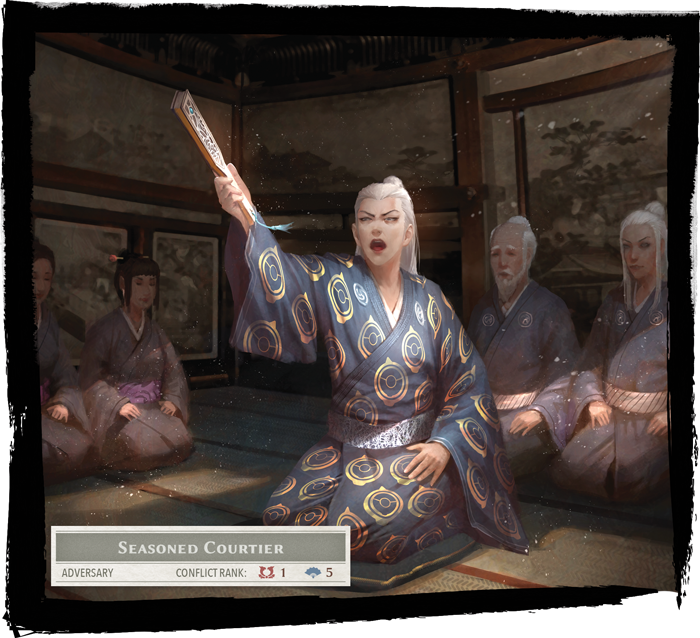 For example, a Seasoned Courtier has a combat value of one, yet an intrigue value of five. This NPC could be defeated in armed conflict by even a young bushi, yet he would provide an appropriate social challenge for a group of characters to convince that the urgent business they bring to the castle is, in fact, as urgent as they say. Conversely, the Loyal Bushi can represent a young samurai roughly on par (or a bit more advanced) than an individual player character, having a combat value of four and an intrigue of two. Though not completely at the mercy of a silver-tongued courtier, a skilled negotiator will certainly have a strong advantage. In a skirmish, however, the Loyal Bushi could be a threat to be taken seriously or a potential ally to help the players battle injustice. Ultimately, though, the Conflict Rank is merely a guide, and Game Masters should take into account the players’ resources, skills, and tactics that can make opposition more or less difficult. 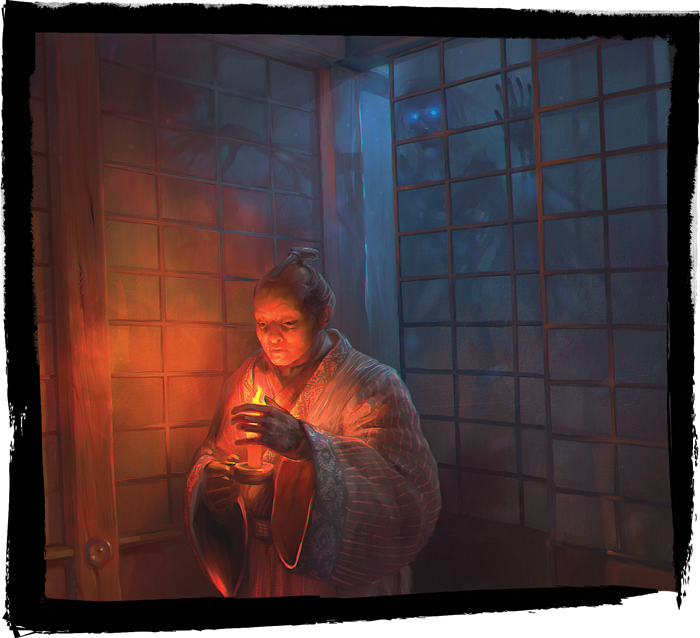 And of course, the devil is in the details—journeying into the Shadowlands poses much different threats than attempting to uncover a conspiracy at the Emperor’s Winter Court. In fact, even within the Shadowlands, there’s no end to variation between the enemies that you may encounter. Born in darkness and hatred, the spawn of the Shadowlands poses an eternal threat to Rokugan. But for the Kaiu Wall and generations upon generations of spilled samurai blood, the realm would surely be overrun. The cunning and power of these incredible monstrosities cannot be overstated, and their danger cannot be ignored. You may find yourself set upon by one of the lowliest threats of the Shadowlands: the diminutive Goblin. Alone, a Goblin poses not much more threat than a farmer armed with a sharp field implement. In their typical swarms, however, these ravening miscreants can overwhelm a samurai without warning. Though their spears and bows are small, the swarm brings them to bear viciously. 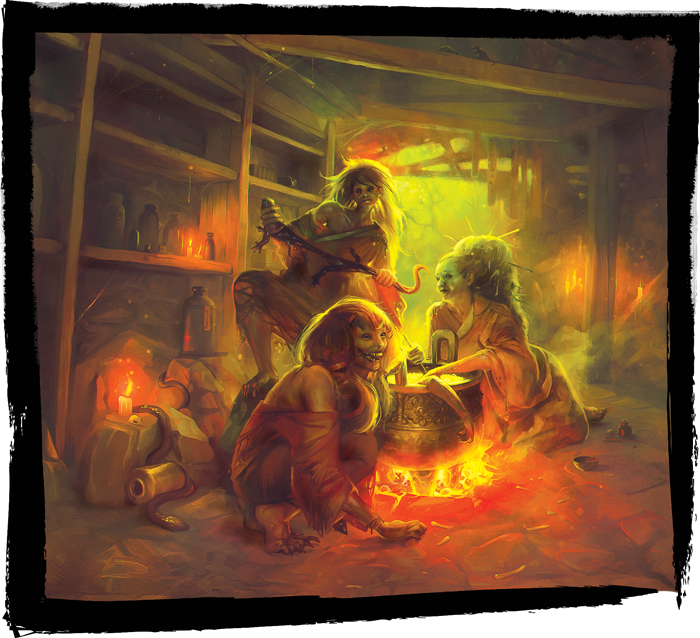 In fact, whenever a Goblin attacks with the assistance of other Goblins, they may spend opportunity from the attack roll to deal additional damage to nearby targets—bringing an avalanche of bloodthirsty frenzy to bear against the players. On the other end of the spectrum is the Sinister Oni. These hulking demons spill forth from Jigoku to ravage and destroy with their teeth, claws, and horns. Truly fearsome in battle, the Sinister Oni boasts a combat rating of twelve, which means it would make short, bone-grinding work of novice samurai, and even a group of senior warriors would wish to bring the aid of their allies and a fair amount of jade. To stand against this Oni is to test your resolve against destruction itself. A Sinister Oni’s unholy flesh provides protection from most weapons and spells, meaning that its formidable endurance is especially difficult to chip away. The terror of this beast truly shines in its special abilities, though. The Oni may unleash a horrific roar with Dread Bellow, forcing all creatures in the vicinity to pass a Meditation check or become afflicted and forced away from the Oni! Whether you’re facing down a pack of Goblins or engaging in a battle of wits at court, the story of your adventures in Legend of the Five Rings Roleplaying is the story of Bushidō. Every plot point, every story arc, every struggling peasant, every haughty noble, every Jigoku horror; all are the ink in which your path of Bushidō is written. Your legend begins soon, samurai. Serve your Emperor. Bring honor to your family and clan. 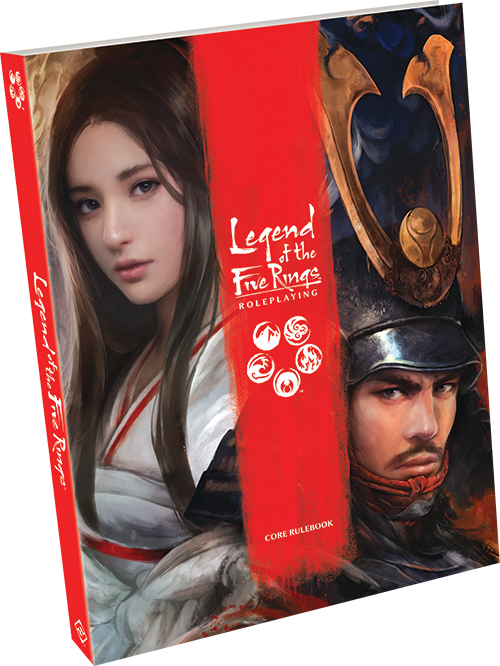 You can pre-order the Legend of the Five Rings Roleplaying Core Rulebook (L5R02), along with the Dice Pack (L5R03) and Game Master’s Kit (L5R05) at your local retailer or online through our website today!